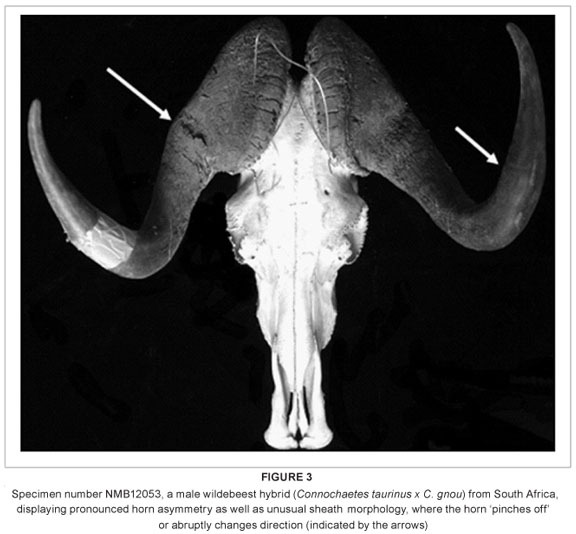 Here we report on a series of anomalous cranial morphological characteristics displayed in a hybrid (blue x black) wildebeest population culled at Spioenkop Dam Nature Reserve, KwaZulu-Natal, South Africa. These hybrids were identified initially from their external phenotype,23 (Rushworth I 2000, personal communication, March 08), based primarily on horn morphology and pelage, and have been reported in detail elsewhere.22 The primary goal of this paper is to briefly describe unusual dental and sutural anomalies, as well as other unusual morphological traits present in these hybrids. Similar anomalies have been demonstrated in the skeletons of primate hybrids between lineages that have diverged over a comparable time frame (i.e. Pleistocene),24,25,26 as well as a handful of other mammals,27,28 and this study provides further evidence that cranial morphological anomalies characterise mammalian hybridisation more broadly. Because mammalian hybrids are also known to be polymorphic,29 a goal of this study was to qualitatively assess the range of phenotypic variation in the hybrid sample. These results may assist in identification of regions in South Africa with high versus low levels of hybridisation, as it has been shown that the identification of such anomalies allows detection of hybridisation on the landscape.25 This has important implications for conservation of the rarer, endemic black wildebeest. Individual hybrid wildebeest crania were examined and scored for the presence of a suite of qualitative (non-metric) cranial traits, with emphasis on dental and sutural morphometric anomalies comparable to what is known to be present in hybrid primates.24,25,26 Qualitative cranial traits scored included: supernumerary teeth, extra sutures or ossicles in the maxillary or premaxillary region, rotated teeth and dental crowding.26 The expression of supernumerary teeth was also recorded, as this has been shown to vary across mammalian hybrids.26,27 Additionally, the crania were examined for other evidence of developmental abnormalities or abnormal trait variation. 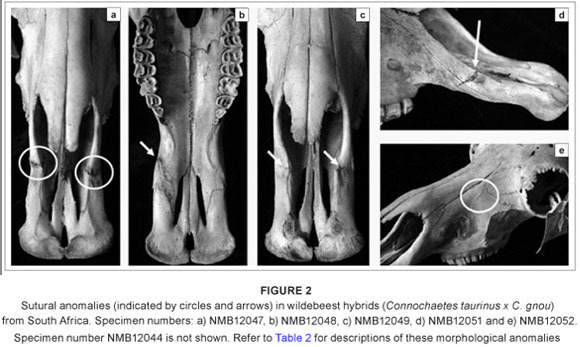 The dental and sutural morphological anomalies found in the 13 hybrid wildebeest are listed and briefly described in Table 2. None of the hybrids has supernumerary teeth, although one adult male individual (NMB12043) has a unilateral rotated premolar (Figure 1a). The only other dental anomaly is an unusual premolar root (Figure 1b), also in an adult male. This individual is old and it is possible that the root was damaged as a result of dental attrition. 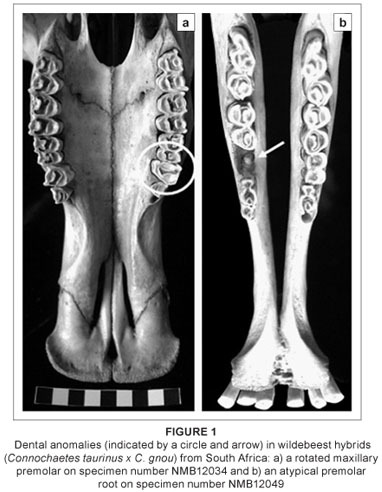 Sutural anomalies are more common in the hybrid wildebeest; six individuals (46%) had sutural anomalies, five of which were additional sutures in the premaxillary region. These sutural anomalies occur in both males and females. The additional premaxillary sutures do not represent sutures that are seen earlier in ontogeny, but are instead new atypical variants. It is possible that these premaxillary sutures provide some disadvantage in terms of fitness by altering the physical properties of the snout in these hybrids. No comparable dental or sutural anomalies were found in the non-hybridised blue wildebeest (n = 20) or black wildebeest (n = 20) samples,6,22 suggesting that their frequency across non-hybridised wildebeest is low or absent. Moreover, the high frequency of sutural morphological anomalies seen in the hybrids greatly exceeds 'normal' levels of atypical qualitative trait variation in mammals (generally less than 5%), and is comparable to what was observed for dental anomalies in known-pedigree hybrid male F1 baboons (50%)26 and for sutural anomalies in an identified hybrid zone within eastern lowland gorillas (45%).25 There is also considerable variation in the expression of these sutures across the hybrids (unilateral versus bilateral, superior versus inferior; see Figure 2). In addition to these dental and sutural morphological anomalies, there are also three individuals with abnormal horn sheath morphology, one of which also has a pronounced horn asymmetry (Figure 3). Although the presence of unusual and often intermediate horn morphology has been observed in hybrid wildebeest, and used to detect the presence of hybridisation in wild populations,21 the variation in horn morphology among the hybrids examined here is nonetheless striking. Substantial cranial variation is also present across the sample, both in terms of size and shape (Figure 4); this variation (both cranial and postcranial) has been more fully quantified and described elsewhere.22 While hybrid morphology is typically depicted as intermediate, in reality hybrid populations are highly variable, or polymorphic,29 with individuals showing a range of phenotypes that can be intermediate to the parental morphs, can resemble one parent or the other, or can fall outside of the parental range. The high variability seen here is consistent with such expectations. Although this is a preliminary report documenting hybrid features in the crania of wildebeest, the implications of the results are nonetheless significant. Most importantly, these wildebeest provide additional evidence of dental and sutural morphological anomalies in mammalian hybrids. Previously, it has been hypothesised that such morphological traits, which have been observed in the hybrids of known pedigree and wild baboons,26 wild gorillas25 and recent and Pleistocene squirrels,27 are broadly characteristic of mammalian hybridisation.26,29 The presence of these morphological anomalies in the wildebeest provides further evidence in support of this hypothesis. This study also demonstrates that the expression of such anomalies may differ across phylogenetically divergent mammalian groups. In primate skulls, the morphological anomalies associated with hybridisation were predominantly mandibular distomolars, although unusual zygomaxillary sutures were also fairly common.24,25,26 For squirrels, distomolars were also present, although they were maxillary.27 In both cases, the pattern of expression differed from the parental taxa. In the wildebeest sample, morphological anomalies were largely sutural, with limited evidence of dental anomalies, and considerable variation in horn shape. It will benefit our understanding of hybrid morphology to continue to examine morphological trait variation in skeletal collections of other mammals to more fully understand the range of variation in the mammalian hybrid phenotype. Finally, this study shows the potential for identifying hybrid wildebeest and zones of introgression on the landscape when animal provenance is known.25 The identification of hybrid zones can provide insights into the dynamics of extant populations, as well as the recent historical and/or evolutionary past of the groups under investigation (sensu Ackermann and Bishop25), depending on when the skeletal material was collected. Identifying wildebeest hybrids in situ is also important from a conservation perspective. There is an ongoing effort to minimise the impact of introgression of blue wildebeest genes into black wildebeest populations and such increased powers of identification, applied either alone or in conjunction with molecular data, could play an important role in efforts to conserve this endemic South African species. © 2010. The Authors. Licensee: OpenJournals Publishing. This work is licensed under the Creative CommonsAttribution License.